The source of the subject is Ovid's Metamorphoses. The love affairs of gods never bode well for mortals; there were times when they caused nothing but suffering even for some of the nymphs. 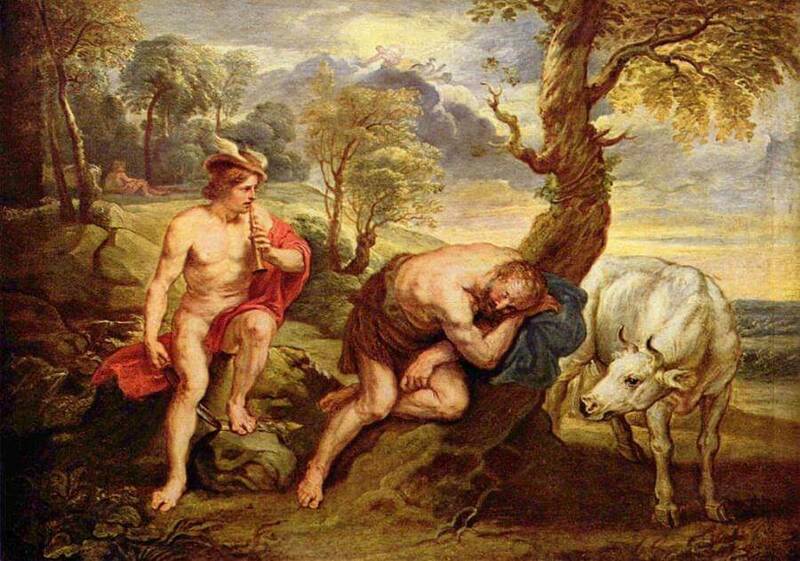 Io, the beautiful daughter of the river god Inachus, fell prey to the passion of Jupiter, who - in order to hide her from his jealous wife - turned the girl into a cow. The wily Juno talked her husband into giving her the fine-looking animal and had the hundred-eyed Argus guard it. Jupiter gave Mercury the task of killing the wicked guard. The inventive god (the Greeks called him "Hermes dolios", the schemer) approached the meadows, herding some goats which he had stolen along the way, and played songs on his pipe. The guard was charmed by the new and masterful melodies. Mercury watches intently as Argus is mesmerized by the sound of the flute, and he is already reaching for the weapon with which he will behead the sleepy guardian. Rubens depicted a fipple flute in place of a Pan-pipe. From the aulos used at feasts of Antiquity and the Roman tibia through the medieval bagpipes and Renaissance-Baroque horns and musettes, all the way to the saxophone of our times, every wind instrument was attributed with having a dangerous mesmerizing power.